This session will introduce an integrated set of adaptive learning competencies that are essential for generating effective, collective, community impact. 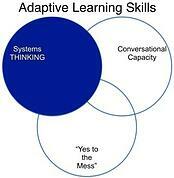 These competencies are: systems thinking, conversational capacity, and 'yes to the mess'. The webinar will present these concepts using several real world examples from community and public policy initiatives, and conclude with a discussion for how to build these competencies. Communities around the globe face an expanding range of tough, interconnected, messy problems such as poverty, violence, obesity, mental illness, police and community tensions, climate change, education, and health inequity, just to name a few. 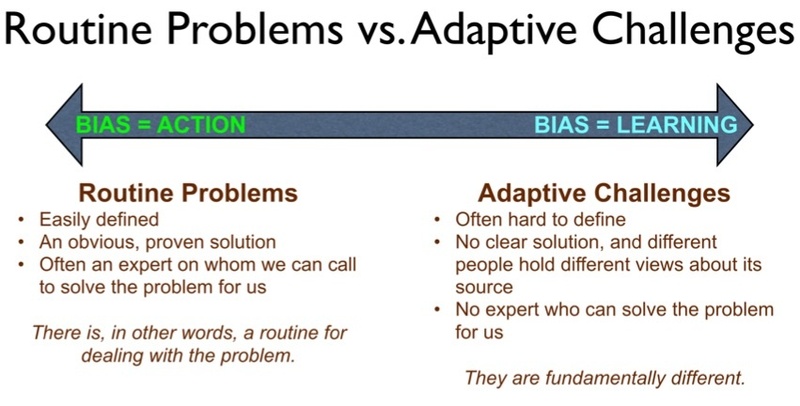 These problems – and many others like them – are what we refer to as adaptive challenges. What do we mean by that? All our difficulties fall somewhere on a spectrum; at one end of this spectrum we find routine problems, and, at the other end, adaptive challenges. A routine problem isn’t considered routine because it happens regularly, but because we have a routine for dealing with it – a protocol, a process, or expert on which we can depend for a reliable fix. A routine problem may be irksome and expensive, but at least we’re in familiar territory and know what to do about it. When we’re facing an adaptive challenge, on the other hand, we’re off the familiar trail in uncharted territory where there are no proven routines, protocols, solutions, or experts. To successfully negotiate an adaptive challenge we must work and learn with others to navigate the alien terrain. All the problems we face in life fall somewhere between these two distinct poles. Communities must orchestrate a process of learning if they are to effectively engage and resolve adaptive issues. Because different perspectives must be shared, integrated, and run through a forge of refinement to improve and apply, communities need to guide or steer “messy” processes with a diverse set of interest groups: local leaders, public and academic institutions, as well as private sector organizations. Collective impact is a process that has been developed in response to guiding communities and networks through such “messy”, adaptive learning processes. If facilitated well, it appears to orchestrate an agile process of learning. In many cases, however, the process bogs down, failing to maintain the initial momentum of its passionate leaders, who eventually become disillusioned and “drop out of” the process. Many efforts wane or even die. Why? The authors of the Channeling Change article indicate the need for adaptive leadership skills. But what are these skills? How do you know if the backbone organization and its leadership possess them? And how can you build a sufficient amount to facilitate the collective impact process? There are (at least) three essential skills of adaptive leadership. 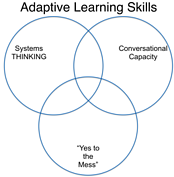 These skills are: systems THINKING, Conversational Capacity, and Improvisational Learning. 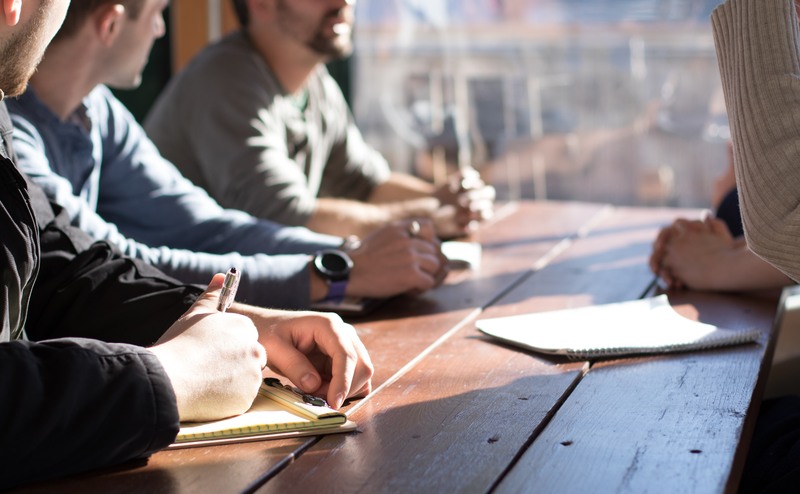 They help you find the leverage needed for fundamental improvement, by accelerating a process of learning, where community members engage in rigorous and balanced conversations about highly emotional topics – things they care about. 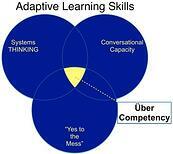 In other words, adaptive learning skills help people and communities learn faster, smarter, and together. It’s often assumed that people and groups already possess these skills, and that they just need to be awakened by the collective impact process. But they’re not. And without consciously building and applying these skills – transforming the leadership culture  in the community and network of organizations – the likelihood of achieving intended results with the collective impact process is greatly diminished. What are these skills? 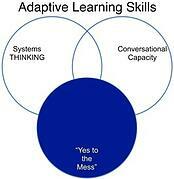 They are Systems THINKING, Conversational Capacity, and a suite of skills simply named Yes to the Mess. The skill of Systems THINKING is essential for identifying high leverage places to intervene. With limited time and resources, it helps communities identify changes that provoke the most profound and sustainable improvements. Low leverage occurs when you fight the “physics” of the system, when the more you push it to change, the more it pushes back. Low leverage occurs when today’s problems come from yesterday’s solutions, when you fall victim to unintended consequences. Low leverage even occurs when you do improve performance – but the improvement is anemic relative to the (wasted) Herculean amount of effort you applied to the problem. You find leverage when you fundamentally improve the way the system behaves, generating the optimal behavior you desire. This high leverage competency is referred to as systems THINKING. Thinking is capitalized because this type of systems thinking emphasizes how we think about systemic issues instead of adopting the overly simplistic (and mostly unhelpful) perspective that “it’s all complex and connected.” At its core, systems THINKING is based on a foundational principle: Behavior is generated by structure. How we’ve “structured” our resources, organizations, and communities is generating the behaviors we like and those we don’t. If we are to create the future we want, we’ll need to understand how we’ve structured things…and how we’ll have to change that to get the behavior we want. The mind set required for systems THINKING is an unwavering commitment to understanding the whole set of relationships (structure) driving important “real world” behaviors. We assume we’ve been using boundaries that are too narrow to understand the problem, focusing on our little part of the system – our silo (e.g. education, health, public safety, etc…) – as if it’s the most important. It also assumes we’ve not been thinking hard enough about how the world “really works”, by overlooking time delays, vicious cycles (and other feedback loop behavior), and unintended consequences. The skills of systems THINKING include a rigorous framework for defining issues and mapping out your assumptions about cause and effect. You “picture” the system so you can “see” it. This is absolutely critical for finding leverage. 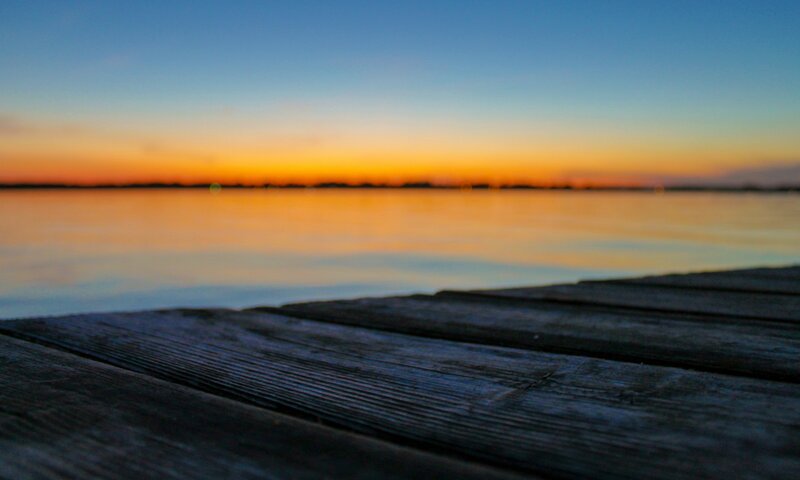 In the process you apply a skill to help you move from the typical narrow perspective to an “up and out” perspective, where your boundaries of awareness are expanded to see more clearly, to see broader and farther in time and space. You use – where appropriate – computer simulation tools to trace out the implications of assumptions…and improve THINKING. When you apply the skills of systems THINKING, you move from being a reactive, “woe is me” victim of forces outside your control to having the wisdom and potency to intervene in ways that will make a profound difference. In our world of mounting complexity and change, building organizations and teams that work well under pressure is more important than ever. But while it’s easy to put together a team that works when facing simple problems, building a team that performs when things get tough remains an elusive and frustrating task. The reason, according to Craig Weber, is that traditional team building overlooks the most important piece of the puzzle. That missing piece is conversational capacity—a team’s ability to have open, balanced, learning-focused dialogue about difficult subjects, in challenging circumstances, and across tough boundaries. A group with high conversational capacity can perform well, remaining on track even when dealing with their most troublesome issues. A group lacking that capacity, by contrast, can see their performance derail over a minor difference of opinion. In this sense, conversational capacity isn’t just another aspect of effective teamwork—it defines it. A team that cannot talk about its most pressing issues isn’t really a team at all. It’s just a group of people that can’t work together effectively when it counts. This is a critical competence for a successful Collective Impact process that requires people communicate and collaborate about tough issues and across challenging boundaries. Sounds simple, right? All a team has to do is boost its conversational capacity and all will be well. Unfortunately, it’s not that easy. In the quest to build capacity we face a formidable obstacle: human nature. It turns out that reliably effective teams are hard to build because primal aspects of our nature, rooted in the powerful fight-flight response, actually work against teamwork. Fortunately, there’s hope. There’s a proven discipline—a veritable conversational martial art—that allows people and their teams to remain open, balanced, and learning-focused as they tackle their most troublesome issues. Armed with this discipline, communities, organizations, and teams can respond to tough challenges with greater agility and skill, performing brilliantly in circumstances that incapacitate less disciplined teams. The improvisational mindset assumes that no matter how messy, how difficult, or how confusing the current predicament, there is always a creative and constructive path forward. At its core, the improvisational process stems from an affirmative mindset. But in addition to the affirmative orientation, another essential skill of improvisation is rapid experimentation and embracing errors, the “learn as you go” approach to performance. This approach reflects the observation of Kurt Lewin, who noted that the best way to learn about any system is to try and change it. Rather than sit back and wait for all the information to come in before taking action they jump in to the performance and learn as they go. These three competencies combine to form an über competence, a meta-skill that turbocharges the effectiveness of a person, team, organization, or community. Without it a group will almost always underperform – especially when it’s facing an adaptive challenge. Systems THINKING can help a group identify the high leverage actions that will spark the most constructive change. Conversational Capacity enables a group of smart people to work smart by balancing candor and courage and curiosity and humility under pressure. Agile Learning helps people work in more open, flexible, experimental ways in situations where rapid learning is the key to progress. Together these competencies empower people and groups to come together to tackle their most pressing issues. In the beginning of this article, we referred to these skills as analogous to the skills needed to play music, or a sport, or many other similar endeavors. In fact, they are the skills needed to excel at such endeavors. What distinguished basketball players like Larry Bird and Magic Johnson from their peers wasn’t their skills at dribbling, passing and shooting – it was their über skills of seeing the full court and imagining how things were playing out, their ability to selflessly pass the ball and to work with all players on the team, and their ability to turn a broken play into a basket. The same happens in most other sports (e.g. football, soccer). There are similar skills in jazz – seeing all of the music as a tableau and the potentialities of it unfolding, to collaborate in ways that pool multiple perspectives, and to improvise and trade off soloing and supporting. Helping collective impact meet its potential requires integrating the adaptive leadership skills just described. Acquiring this meta-skill, in fact, will transform a community’s leadership culture. 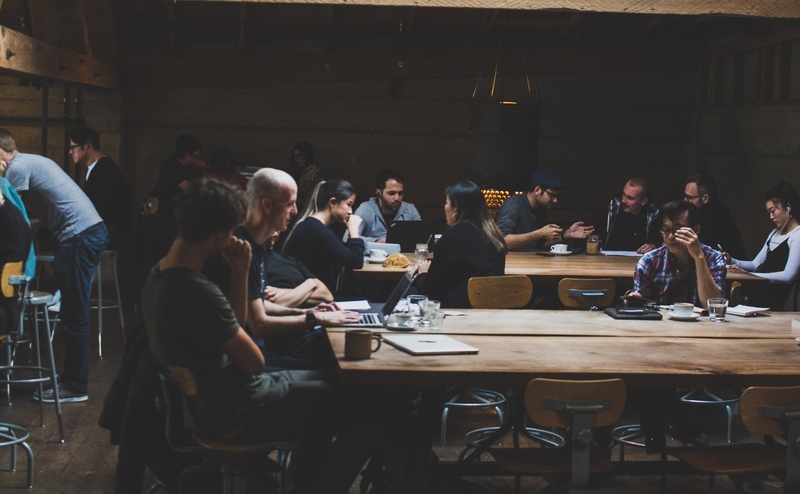 It’s our contention that anyone starting a collective impact initiative should pay as much attention to building and applying these adaptive leadership skills as they do any other part of the process. They increase the likelihood they’ll make the constructive changes they’re seeking while creating a more connected, resilient, and learning-focused community in the process. Chris Soderquist has over twenty years experience as a strategy and leadership consultant / educator, with a diverse set of clients from the private and public sectors. He is a Visiting Executive Lecturer at the Darden School of Business (University of Virginia), an instructor in Marlboro College’s graduate school, a designer and instructor of the Boeing Engineering Leadership Program, and co-designer of the Legislative Health Certificate Program at the Georgia Health Policy Center. He is a contributing author to The Change Handbook (Berrett-Koehler, 1999) and delivers systems thinking webinars for isee systems, where he is a consulting partner. 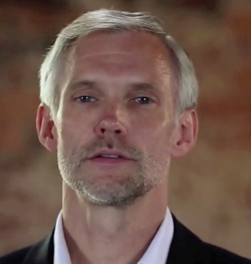 His video, Finding Leverage, won the Communicator Award of Excellence for Cause Marketing. His most recent video series is available on the CDC-TV channel. Chris’s most recent focus areas include adaptive learning and leadership; collective impact processes; community / regional well-being (including economic, public health, energy and environmental policy); NGO strategic planning; and local, community-based sustainability efforts. Additionally, his research interests include linking dynamic modeling with social network analysis, as well as dashboard/scorecard development, implementation, and monitoring. Some of Chris’s clients include: The Centers for Disease Control and Prevention, The World Bank, UNDP, World Economic Forum, the State of California, the State of Georgia, the Cincinnati Child Poverty Collaborative, The Boeing Company, Hewlett-Packard, Nissan, and Northwestern Mutual.